Updating Facebook Status using Fake Iphone device. Although, we always have to be satisfied with whatever the GOD has given to us, still many times there were emotions inside the body to get more and more. Same applies in the case of Smartphones too, people always wants to have the expensive and the latest model in their hands, they don’t even care if the pocket allows that or not. Actually, people understand this thing but whenever they look their dream Smartphone in other’s hand, the emotions automatically starts to grow. Even people has learned to ignore all such things in their daily routine, what to do for the inclussion of these attractive devices in the Facebook status updates too. Everytime we logged into our Facebook account, there is any status update waiting for us, with the iPhone 6s label next to the status time. How can we ignore this, the simplest way is to quit the Facebook 🙂 , the hardest way is to buy any iPhone 6s device by taking some debts. Wait, we have another simple solution for the problem, actually TODAY, we are here to discuss the same with all of you, updating the Facebook status using the Fake iPhone device. Today, we will guide you about How to post the Facebook status or picture with the iPhone 6s label next to the “status time” as device. We also wants to assure you, it will be without any debts or even without the expensive iPhone device 🙂 . Actually, the logic behind this is very simple. We just have to create a Facebook app with the desired device name, and post the status / pictures using the same created Facebook app. We guess, nobody wants to wait any more. Let’s move to the main procedures to implement this trick, and increase some of our social value too. Creating a New Facebook App with the desired Device Name. Important: Don’t panic with the term “Creating a New Facebook app“, this is as simple as creating any new Facebook account. Below are the simple instruction to create one for you. 1)- Log on to your Facebook account. 2)- After logged in, Open http://developers.facebook.com in the new tab of your browser. 3)- Now, at Top-Right, just hover to the “My Apps” drop-down menu and select / open “Add a new App” from there. 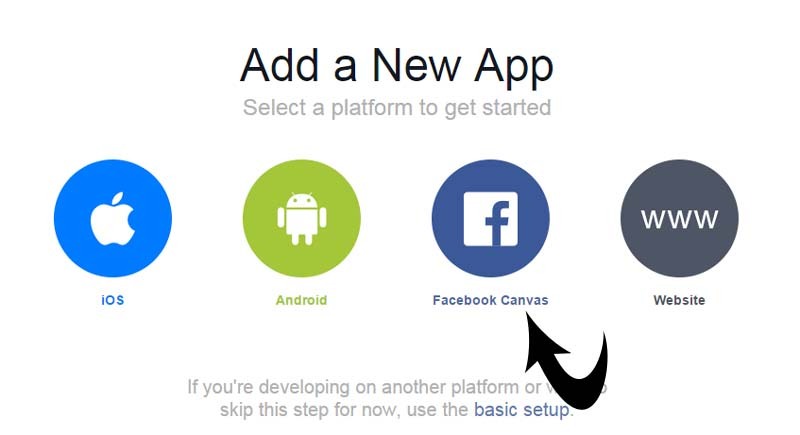 4)- Now, you will be with a popup window, asking to select your desired platform, Choose “Facebook Canvas” from there. 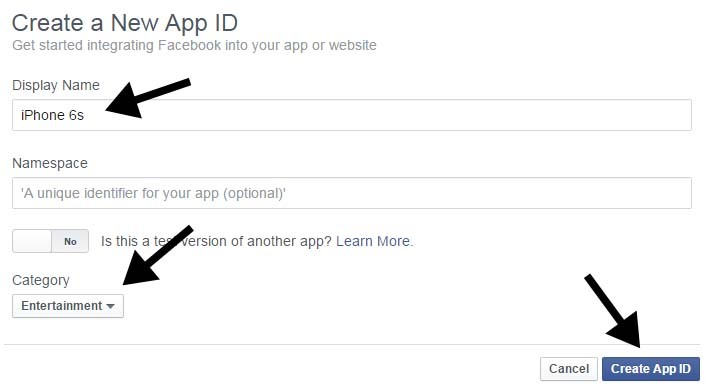 5)- As you are creating a new Facebook app, Hit to the option “Skip and Create App ID“. 6)- Now, you will get a new popup Windows, asking for the app name, category etc. Supply “iPhone 6s” in the app “display name” section. In the category section, you can opt any, we recommend you to use entertainment. Leave everything else to the default. 7)- Now, Click “Create App ID“, You may get the security check here, follow the instruction to clear the security check. 8)- Hurray!, You have successfully created a new Facebook app to fool your friends. Be patience, there are some more steps remaining, please concentrate on them 🙂 . 9)- Now, you will be on the dashboard of the newly created Facebook app. 10)- Copy the “App ID” to a notepad file, as it will be required in the later part, while posting status message or pictures. Configuring the Privacy setting for the newly created Facebook App. 1)- On the Facebook app dashboard, look for the option “Settings” in left side. Click to it. 2)- Once you get inside the “Settings” page, look for the “Contact Email” section. Fill out your email identity there and HIT “Save Changes” button. Important: You have to provide your valid email identity to change the privacy settings of the Facebook app. 3)- Now, look for the “App Review” in the left Menu of the Facebook app dashboard. Click to it. 4)- Now, Make the Facebook app available to the Public, by turning the on-screen button from NO to YES. That’s it, You have successfully configured your Facebook app and can use it to post the Status messages on your Facebook profile, with showing your new iPhone device, oh sorry fake iPhone device 🙂 . 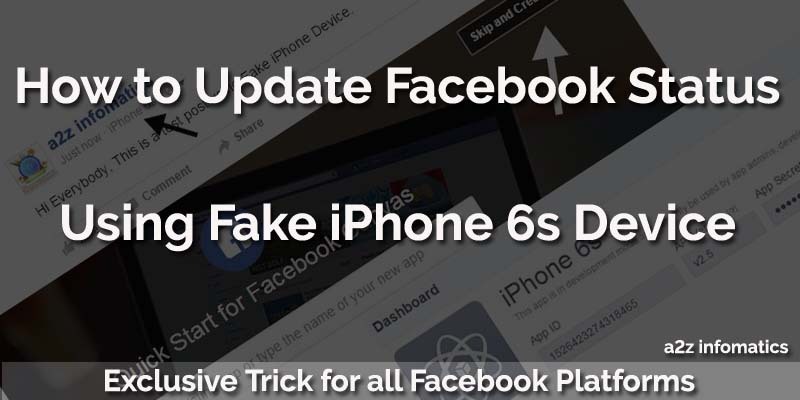 How to Post Status Message using newly created Facebook App (Fake iPhone device). 1)- Copy the given link to the notepad file. ( https://www.facebook.com/dialog/feed?_path=feed&app_id=XXXXXXXXXXXXXXX&redirect_uri=https%3A%2F%2Fwww.facebook.com ). 2)- Now, just replace the XXXXXXXXXXXXXXX part with your App ID, created in the above steps. 3)- After doing the modifications, Copy the complete link into the new tab of the web browser, Open it. 4)- Yipieee, You are on the main page, Type whatever you want to share with your friends or relatives. It will be labelled with your Fake iPhone device, next to the status time. 5)- Oh, Have you clicked the SHARE button after typing the message 🙂 . 6)- Check your Facebook Timeline to confirm the actions. Don’t you think, YOUR WISH HAS CAME TRUE. How To Post any Image / Picture using using Fake iPhone device. In the above section, you have learned about posting status messages using the fake iPhone device. Let’s move to the last section, posting image / pictures using the fake iPhone device. 1)- Open the newly created Facebook app in a new tab, leave it alone and move forward. 2)- Open another new tab in the browser and Open http://mbasic.facebook.com . (Oldest Mobile version of the Facebook). 3)- Look at the TOP Menu in the opened Window, there is a “Profile” option there, Click that. 4)- Now, click “Add Photos”. 5)- Follow the on screen instructions. 6)- After selecting the desired filter for the picture, Hit Preview button. 7)- That’s it, Hit the “POST” button now. Important: You can perform any of the above steps on the mobile devices too, using Chrome, Opera or UC Browser for the mobile. We Hope, Nobody is here to read the ending notes today, as everybody has gone to update their Facebook status, using the explained Fake iPhone device 🙂 . If anybody still here, reading this, Please do share the reactions from your friends or relatives after you have updated the status using this Fake iPhone device. Let’s make this more interesting, why don’t you people create a brand new Facebook app named iPhone 20s, use the same to update your Facebook status, let the other people keep guessing, from where you get this unreleased version of the iPhone 🙂 . To tell you the truth, we are very curious to hear the reactions of your friends, so please share the same under comments section below. Thats’s it Fake iPhone holder’s, we are signing off now. We will be back with many more “Dream come True” like tricks, as this one. Till then, Bye .. Bye. Take good care of yourself and keep visiting a2z infomatics.